Today, Dr. Burt Fullmer was savagely attacked, after being lured to a cabin in the Princess Auto Camp near Van Nuys. When Fullmer entered the cabin, he was bludgeoned in the head by Dr. J.H. Balzer, while Mary Wade stuck him in the arm with a hypodermic needle full of morphine. Fullmer fought them off, and the three rolled out the cabin door where they attracted the notice of neighboring campers. Responding officers discovered a shovel, rope, and canvas in the cabin, and charged Balzer and Wade with suspicion of assault with a deadly weapon and assault to commit murder. And you’ll never guess the motive for the attack. No, seriously. You will never guess it. The attack on Fullmer was the latest in a series of power plays between warring factions of a splinter sect of the Seventh Day Adventist Church. The excommunicated started the Seventh Day Adventist Reformed Church. However, the fledgling church ran into trouble in a hurry. Blessed with foresight, Mrs. Rowan skipped town right around this time, prompting a statewide search as police sought her in connection with the beating. A week later, she surrendered to police, and stood trial with Wade and Balzer. The three were found guilty, and sentenced to 1 to 10 at San Quentin. David Bourdette Burgert passed away in Toledo, Ohio last year. Described by friends as a “genial gentleman” and an “exceptional conversationalist,” Burgert was also wealthy. Stinking rich, in fact; his estate was valued at $500,000 (almost $6 million in current money). A bachelor, Burgert dictated that all but $500 of his estate be put in a trust fund, the income from which would accrue to the benefit of the Kirkendall family of Omaha, Nebraska. This was all well and good, especially for the Kirkendalls, but Burgert was a man with a vision. His will stipulated that fifty years after the death of Bourdette Kirkendall, Jr. (two years of age in 1927), the remainder of the trust would be used to build “a home for girls between the ages of 16 and 28 years, of small stature (no fat girls need apply), bright, ambitious, stylish, and good to look at,” the Times explained. The newspaper speculated that it might be as long as 100 years before “The Burgert Apartments” (the will provided the building’s name) took shape. Whatever decade the ground was finally broken, no expense was to be spared; at least $50,000 was to be spent on the building’s construction in Toledo. The home would provide accommodation for between 30 and 40 girls, slim and “ambitious to live and to see brighter and better environments of life than what they are used to,” the will stipulated, “for young women who have to provide a living for themselves in the business world; who have natural ambitions to see things as their more fortunate sisters see them. “Nature has given this type of young woman [the will continued] a love for beautiful things that unfortunately parents can not provide.” Perhaps with this last codicil in mind, Burgert attached a photograph of himself to the document and requested that it be reproduced as a painting to be hung where “I may look down on the good work that this will is intended to do” (and perhaps a pillow fight or two). “May the world be bright and happy for those girls as it has been for me,” the will concluded. One can only hope the “comely and ambitious” young women of sometime around 2027 appreciate their benefactor from the past, who clearly didn’t anticipate the advent of fat discrimination lawsuits. Apparently Carl, 40, was vexed that his father left a $300,000 ($3,486,687 USD2007) trust to the aforementioned new wife Hazel. And then there was the matter of the $100,000 trust that Carlâ€™s grandfather was to leave to his son Charlesâ€¦but with Carlâ€™s father Charles out of the wayâ€¦it would go straight to Carl. Detectives didnâ€™t really buy Carlâ€™s long and rambling alibi, involving a gamblerâ€™s den at Seventh and San Pedro, and a dance hall on Hill off Sixth. Nor did they take his alibiâ€™s verification for much, given as it came from a bootlegger and some other underworld habituÃ©s. Despite Carlâ€™s regal upbringing, heâ€™s a part-time barber with a record, having done time in Folsom and Stillwater on forgery charges. He is convicted March 2, and March 9 sentenced to life imprisonment at Folsom; two more trials on points of law (and a botched suicide attempt) failed to free him. But his March 1929 sanity trial got him sprung from Folsom and committed to the State Hospital at Norwalk, to be held until such time as he was mentally competent to go on trial again for the murder charge. As thereâ€™s no further mention of Westcott again, we can only assume he elected to stay put. Gentle reader, please excuse the plain looks of the blog. We are redecorating, and you know how slow decorators can be. It’s our sincere hope that all will be back to gloomy abnormal very shortly. Lord Greystoke bellowed with rage to discover that, while his humble creator, Burroughs, was quite suddenly called away to Ogden, Utah, his offices had been burgled. It seemed that nothing had been taken, all the papers and the small bit of cash that Burroughs kept onhand remained undisturbed. However, the office’s lovely French doors had been jimmied open, and the hinges on the safe battered, as if by a hammer. Surely this had the stink about it of Nikolas Rokoff, recently escaped from a French prison, and bent on avenging the man whose testimony had locked him away! And then, Lord Greystoke dropped his jaw in horror. He should have realized! Of course, the bungled burglary was no more than a diversion, meant no doubt, to distract him from Rokoff’s more sinister designs. Greystoke burst through the ruined French doors of Burroughs’s office, and raced home to determine whether his archenemy had kidnapped his wife and son. Again. Today, nineteen years after Sutherland shot Captain Auble and committed suicide, a Glendale man searching under his house for his dog found a box half buried in the dirt. In it was a 50-page handwritten document in which the cop killer confessed to dozens of other crimes, including burglaries, train and stage coach robberies, as well as a plan to kidnap a California pioneer businessman who once criticized Sutherland when he worked as a waiter. An attached note was addressed to Jack Hendrickson, who, in 1908, was an L.A.P.D. officer Sutherland considered honest. The son of the first City Marshal of Pittsburgh, Kansas, Sutherland was no Confessing Sam; he was a hardened criminal who for unknown but probably psychological reasons had a need to confess his misdeeds without actually taking responsibility for themâ€”-hence the vial of cyanide. He hoped the confession would be published and some of the proceeds given to his wife. Nobody knew how or why the document turned up under the house at 209 North Columbus Avenue in Glendale. 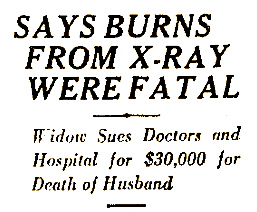 Another mystery, not mentioned by the Times in 1927, is that when Sutherland’s body was searched shortly after his death, police found a number of stamped and addressed letters. Among them was “a remarkable history of Sutherland’s life as set forth by himself. It covered fifty pages of manuscript,” reported the Times in 1908. The Times published copious portions of that document, which was also addressed to Jack Hendrickson and referenced the planned kidnapping. Was the document found in 1927 a copy of the 1908 letter, hidden by Sutherland or one of his cronies lest the letter go astray? Was it a separate document? How did Sutherland have the time to pen two fifty-page documents after killing Captain Auble in the morning and his own death that evening? Why didn’t the police in 1927 realize how similar the newly discovered confession was to the letter they presumably read in 1908? As of February 1927, the police were busy checking their list of unsolved crimes against Sutherland’s confession. L.A. Crimes of Passion Revealed! This Thurday at Central Library, LAPL reference librarians Greg Reynolds and Mary McCoy will be sharing ghastly stories of love gone bad in the City of Angels. The mild-mannered Marie Tucker claimed her husband stabbed himself in the stomach while making a ham sandwich – was it an accident or murder most foul? Who shot Fred Oesterreich in his home in 1922? Was it his lusty wife, Dolly, or her live-in lover, secreted away in an attic love nest? And why did Hattie Woolsteen really kill her married lover? Find out this Thursday, and learn the true stories behind some of Los Angeles’s most notorious crimes of passion. 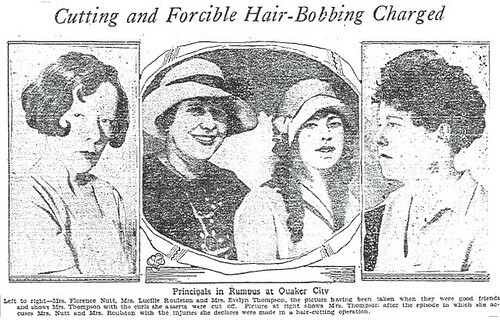 The Whittier social set was agog at the forcible bobbing of Mrs. Evelyn Thompson’s hair by two of her former friends, Mrs. Florence Nutt and Mrs. Lucille Roulston. All three young women had married men in the local oil business. The couples had become friends who frequently partied together. At a recent dance, Lucille believed that Evelyn had spent too much time in the arms of her husband, and in a fit of jealousy she plotted her revenge. The bobbing incident unfolded like this: Evelyn had been out shopping for stockings, and as she passed by Roulston’s home she was flagged down and invited inside to see Lucille’s new hat. Florence Nutt was arrested and charged with mayhem. A warrant had to be issued for the arrest of Mrs. Roulston, because she’d taken it on the lam. She was sighted in places as far flung as the Orient! The mayhem charges would be dismissed, thus ending the criminal case. Evelyn had the option to seek damages in civil court if she wanted, but there would be no further mention of the bobbers or bobbee in the LA Times. Those junkies and hopheads that once provided the occasional bruise on this perfect ripe plum that is Los Angeles—shall be no more! 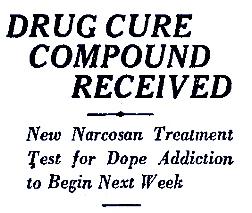 Though alcoholism was cured in 1908, drug addiction still remains to blight the landscape. But Narcosan has arrived to save the day! Drs. E. H. Anthony and Benjamin Blank, their committee of peace officers and other physicians in tow, have at their disposal the first shipment from New York of this new European wonder drug. Any addicted Angeleno can trot down to Blank’s offices in the Quinby Building, Seventh and Grand, and take the cure free of charge. They’ve got fifteen addicts lined up to undergo treatment and are looking to administer to at least another ten, so get down there you, you narc-addled fiend!